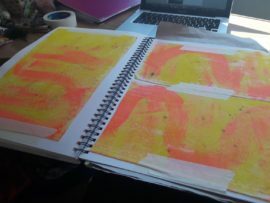 The investigation of colour began with my screen prints, where I was investigating using the transparent coloured inks to show the colours underneath. Unfortunately due to the transparency of the inks this meant that the colours were dulled down or made more of a pastel shade, which lost the brightness of colour that I associate with India. In India, and other hot climates, colours seem to be brighter and more colourful than that of colours in the UK. For this reason colour is really important in my work as if I want to aid the viewer in seeing and experiences Indian culture then I must try to make the colours brighter. I have been thinking about why colours may be brighter in India than in the UK. “Colour depends on the reflection of light from an object” (Dba.med.sc.edu, 2017). Due to the greater amount of light source in these hot climates, there is more chance of the light to be reflected from the object towards the eye. This allows the eye to pick up more colour from the object, therefore increase the brightness and luminosity of the colour. I have considered this in my own work and have increased the brightness of the colours in my work. I have also considered that as part of my degree show exhibition, I may need to add some strong artificial lighting to my piece to increase the brightness in my work. Within this investigation of colour this lead me onto to look at Holi, the Hindu festival of colour, which marks the beginning of spring in India. 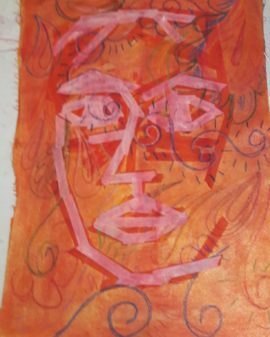 I have been working with some of the holi powdered paints that I bought whilst I was in India. 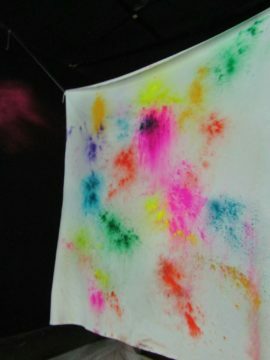 These can be used as dyes for the fabric and also the paint with and just throw at the canvas as the raw powdered paint. I have used the powder to dye a few fabrics, and also to paint with. I have also tried just throwing it at the painting, which I made on pre patterned wallpaper. All of these techniques worked quite well but they lost the energy of the colour and movement of holi festival. 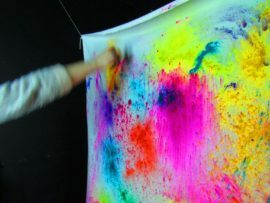 Therefore I am going to try to use the fabric and powder to create movement. 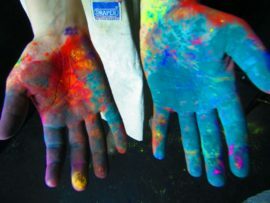 The idea is to have someone wrapped in the fabric and then throw the powdered paint at them as they run around, to dye the fabric that is wrapped around them. I am also looking at dying the fabric that I am using. 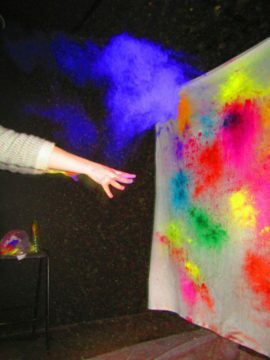 I have tried this on a smaller scale using coloured ink and the Holi paint mixed with water. I really enjoyed the results of these testers. 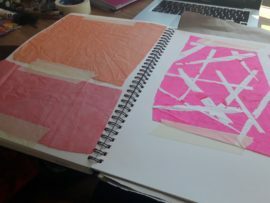 The have a lot of texture and colour and movement in them, which is the the basis of what I want my work to be about. I want the 10metre length of fabric to have colour and depth, with lots of movement, to mimic the busy life and bright powerful festival spirit of Indian culture. Stemming from my research into sari fabrics and their patterns and decoration, I have also been working into several material using sewing. 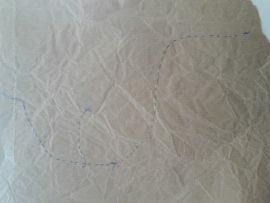 This has included sewing into brown paper, and also fabric. I want to develop this into my 10 metre of extended fabric. Textiles is the main enterprising export of India and is also a huge part of their culture. All of the clothes in India are hand sewn together, they buy the fabric and make their clothes themselves. This means that they stick to their traditional values and all of their clothes and individual to themselves. 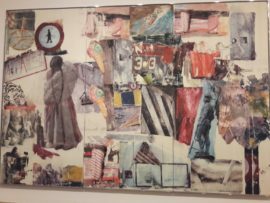 ‘Rauschenberg is well known for his “Combines” of the 1950s, in which non-traditional materials and objects were employed in innovative combinations’ (Tate, 2017). Rauschenburg blends together print and readymades in his works that become almost 3d sculptural pieces with layers of print. 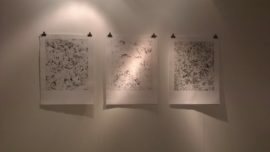 His combination of both 2d and 3d is similar to my own work, in the way that he prints onto the 3d canvas be that a simple canvas or a found object. In my dissertation I looked at the found object as a carrier of trace. A trace of a past life brought into the present by that object. It holds a memory and a history of people that have used that object. In my second year work, I was working with both 3d and 2d together. My final culmination of work in second year combined 2d drypoint prints of footprints with 3d casts of actual prints in plaster. 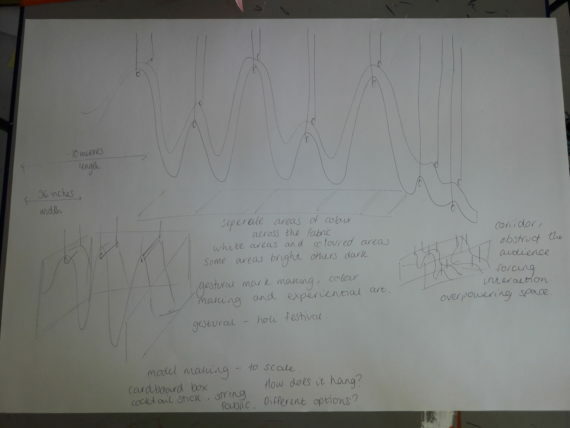 My final degree project work will combine the 2d print along the length of fabric and display this in a 3d sculptural installation piece. 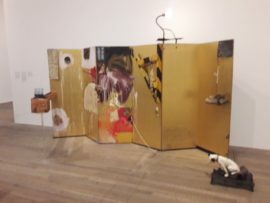 I went to go to see Rauschenburg’s current exhibition at the Tate Modern a few days ago. 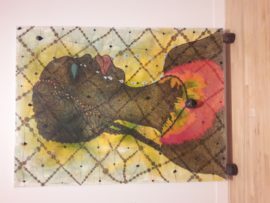 I have recently been watching Chris Ofili painting on the Turner Prize 1998 film. This has been completely eye opening to his painting technique. The way that he creates layers using multiple mediums on top of each other. 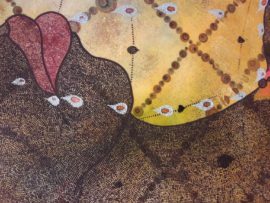 He uses a variety of materials; varnish, paint, photos, glitter, sequins, and even elephant dung. His piece that is in the Tate Britain Gallery, No Woman No Cry 1998, is an example of this layering. “No Woman, No Cry is a very large, densely layered painting that depicts a crying woman set among various abstract patterns” (Tate, 2017). The piece is made up of oil paint, acrylic paint, graphite, polyester resin, printed paper, glitter, map pins and elephant dung on canvas. This layering is something that I am using in my own work. The layering creates a depth in the piece. 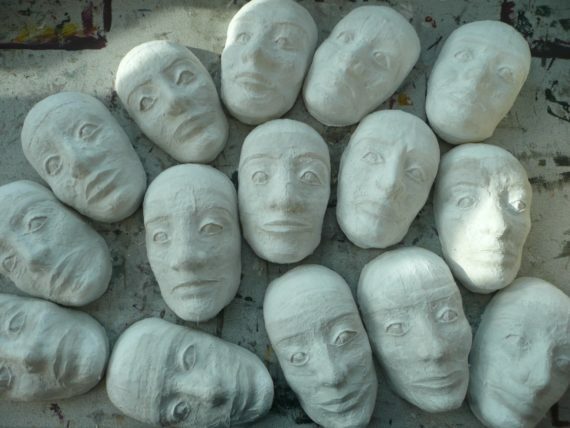 I am hoping that in my own work the layering will create a sense of chaos in the piece. A chaos that mimics the vibrancy and busyiness of Indian culture. Tate. (2017). 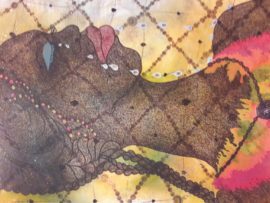 “No Woman, No Cry”, Chris Ofili 1998 | Tate. 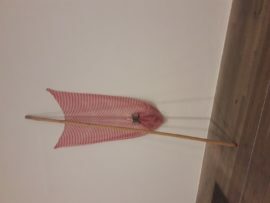 Available at: http://www.tate.org.uk/art/artworks/ofili-no-woman-no-cry-t07502 (Accessed 3 Apr. 2017).